The rugosas blooming right outside my front door just keep begging to be painted. They are so pretty this year! Each time I paint them, it is a new experience. The last rugosa rose painting was a botanical. This one is done using the limited three color palette which makes a soft rose color for the petals. I think it works pretty well for these, don't you? 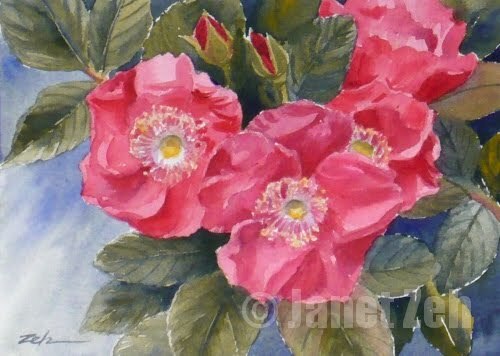 The fine art print, Pink Rugosa Roses, is available in my Etsy shop. Thank you for stopping by today!